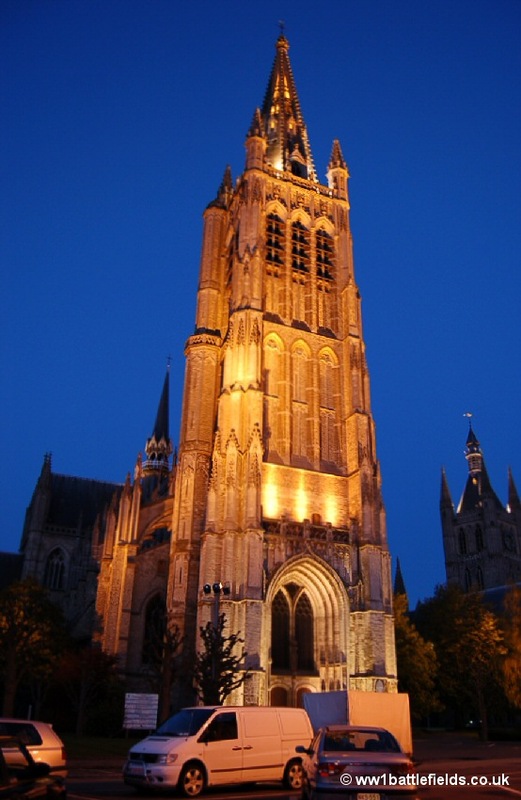 The city of Ypres, at the heart of the Salient, is a great location as a base when visiting this area of the battlefields (see Staying in Ypres page). 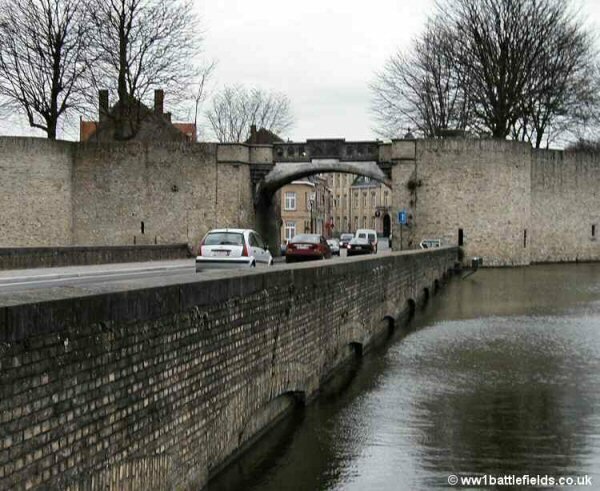 Ypres was the site of fighting early in the First World War. 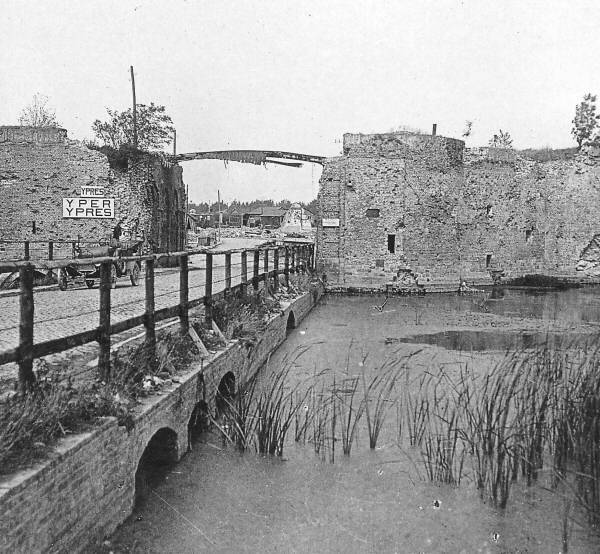 The British were associated with Ypres throughout the war, and involved in all four battles which bear the name of the town. 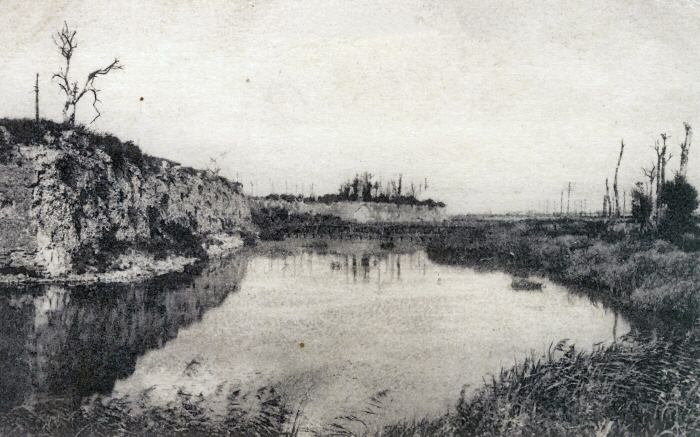 During the war, the town was almost constantly under bombardment, and was reduced to ruins. For battlefield touring in the area, the Holt’s Guide to the Ypres Salient is the guidebook I would recommend to visitors; it contains specific itineraries covering the relevant sites, and I still carry my copy on every visit I make to the battlefields. There is a map which comes with the book which is extremely useful. 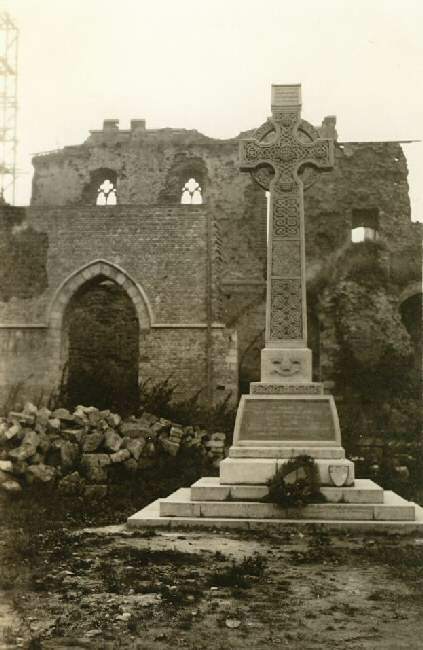 After the War there was a proposal to preserve the ruins of the town as a memorial to the British and Empire soldiers who had fought and died in the salient. This was then modified to preservation of just the ruined Cloth Hall and cathedral. However, the town was eventually fully rebuilt, including the Cloth Hall and cathedral and today, standing in the town, you would hardly believe that most buildings are at most 80 or so years old. When Sir William Pulteney and Beatrix Brice published a battlefield guide in 1925 they recorded: ‘We step from the train to a brightly new and very complete town. We make our way through the streets to the Central Place, and here a square of hotels, shops, houses stare with strange incongruity to a mutilated thing rising stark and jagged against the sky’. This was the ruins of the Cloth Hall, still not then rebuilt. The map below shows where the main sites of interest are located in Ypres. A separate page (in the old format) covers the cemeteries in Ypres. 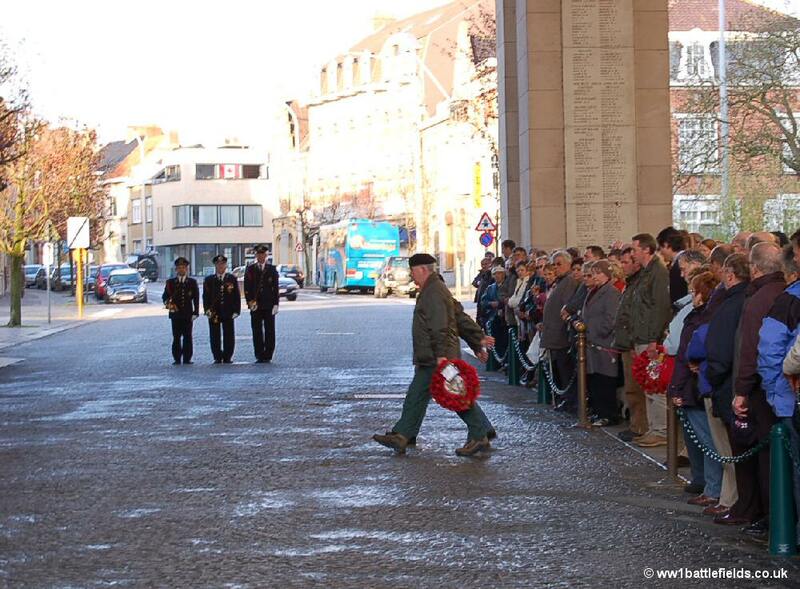 One of the most important sites in the whole of the Ypres Salient is the Menin Gate, one of the Memorials to the Missing. 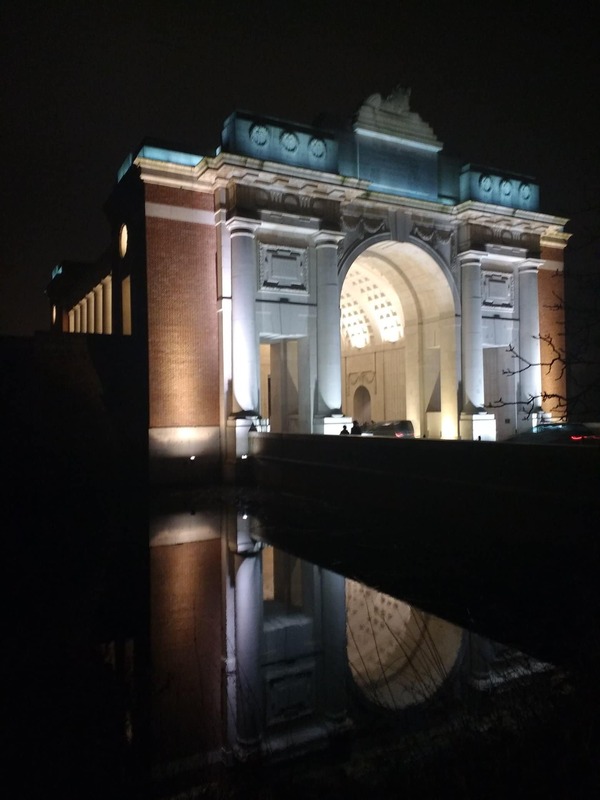 As well as a place to visit in its own right, every single evening of the year at 8 pm, the Last Post is played at the Menin Gate in Ypres. The traffic through the Gate is halted, and the Last Post is played by buglers, a haunting experience in a sombre setting. There are always large crowds to respect the ceremony, and you will need to get there early to secure a good spot to view the ceremony. 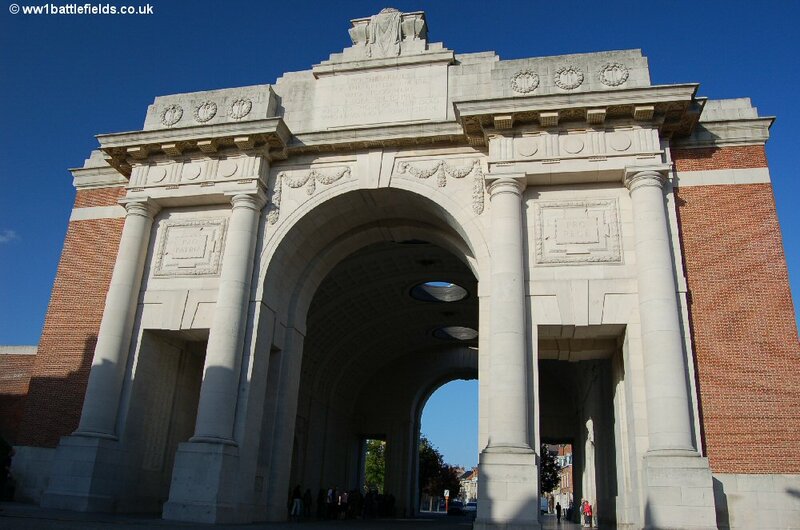 The Menin Gate was designed by Reginald Blomfield with construction completed in 1927. It lists the names of 54,332 men who fell in the Salient and who have no known grave. If you think about this figure for a moment, it is equivalent to the population of a small town, and this is just the men who have no known grave. The names represent the fallen of Britain, Ireland, and what were then the Dominions (apart from New Zealand) up until 16th August 1917. Those with no known grave after that date are recorded at Tyne Cot. The names are inscribed on panels arranged by Regiment, and within that by rank. The two photographs below show the site of the Menin Gate immediately after the War, then in the 1920’s before the construction of the Memorial. 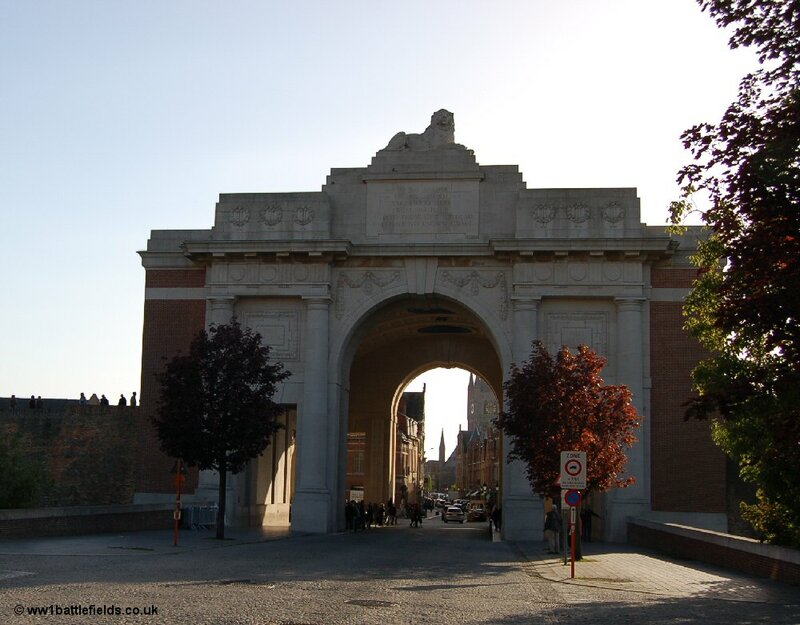 One of the many names on the Menin Gate is that of my father’s great-uncle: Private William Bertie Goody- his name is on Panel 34. William was a professional soldier; he had originally enlisted in the Worcestershire Regiment in 1901 at the age of 19 and after serving with them for several years had left the ranks in 1913. When war broke out, however, he immediately re-enlisted, and was with the ‘Old Contemptibles’, the original British Expeditionary Force that went to War in 1914. The Second Worcesters were involved in one of the most famous early heroic stands against the German Army, at Gheluvelt on October the 31st 1914. However, William Goody was not one of those who fought there; he had been killed ten days earlier near Poelcapelle and was one of many who died in the early days of skirmishes and movement before the trench lines became permanent and have no known grave. A recent memorial located just to the right (as you look out of the town) of the Menin Gate on the ramparts is the memorial to Indian soldiers. 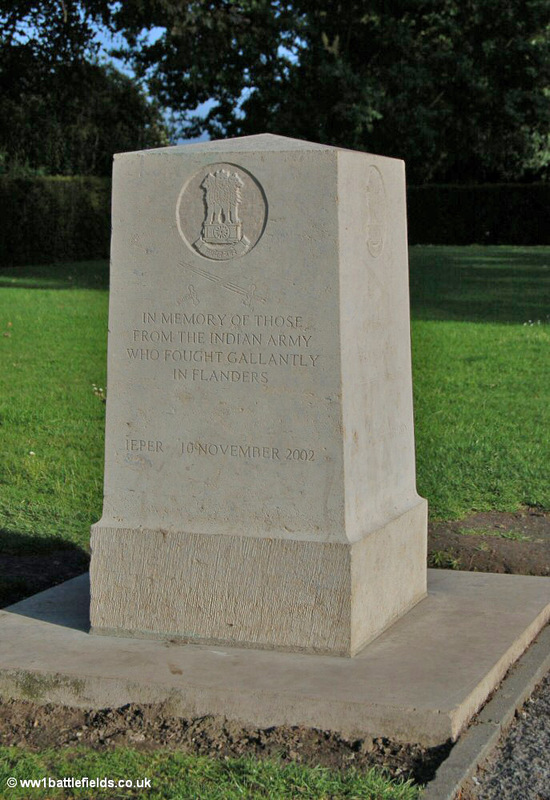 The inscription reads “In memory of those from the Indian Army who fought gallantly in Flanders. 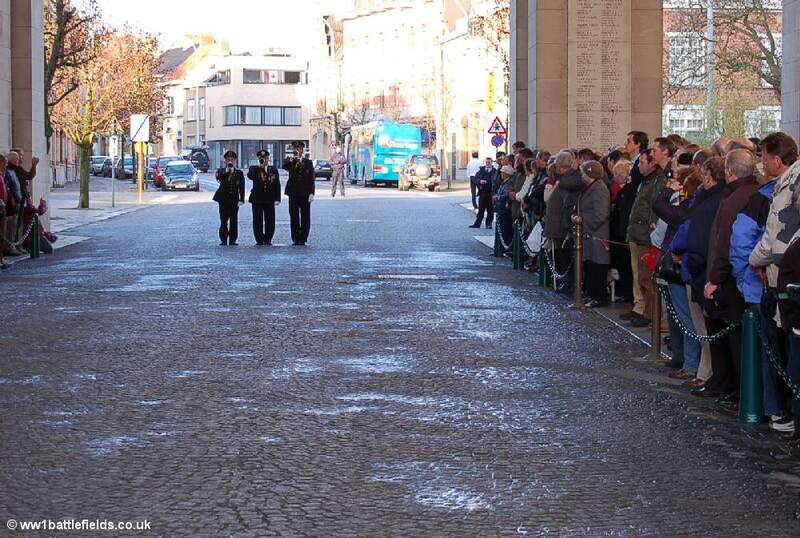 Ieper 10th November 2002”. 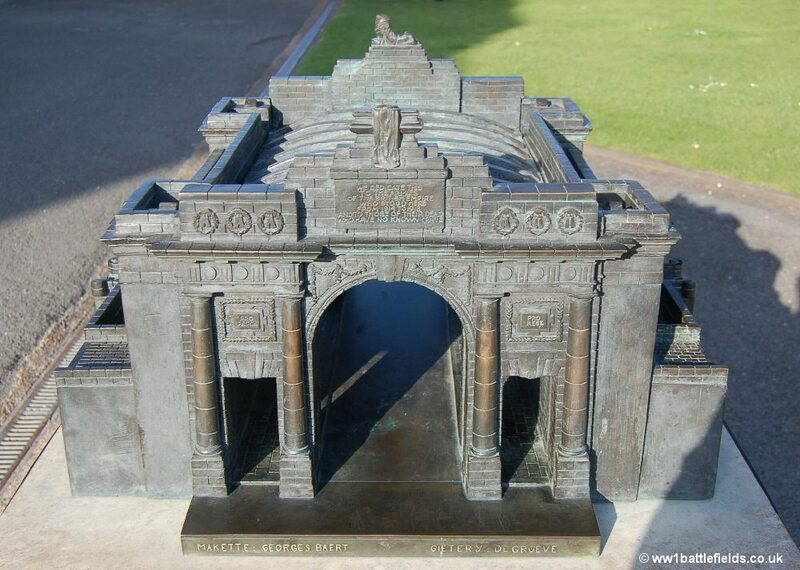 Near this is a small brass model of the Menin Gate with information in braille. 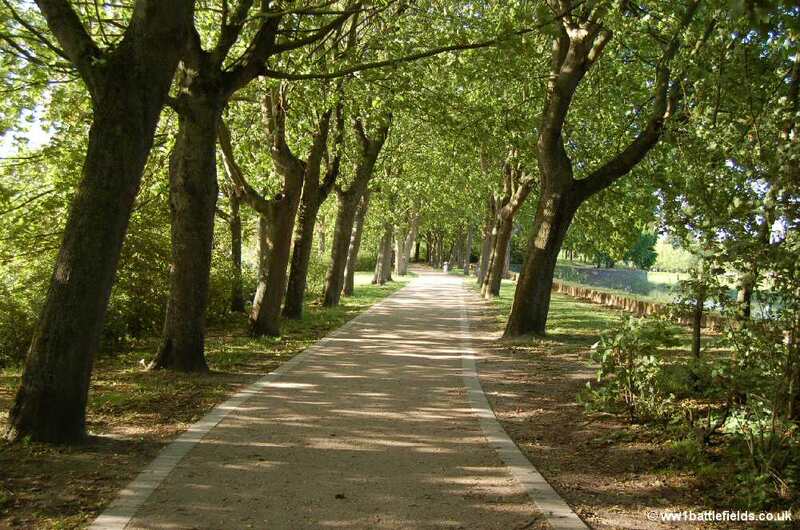 It’s a pleasant walk along the ramparts south from the Menin Gate. A short distance past the Indian Memorial on the left is a brick-built stand with two poems in Flemish and English; one by Edmund Blunden and one by Herman de Coninck who was not born until the Second World War. Old air shafts, some of brick and some of metal rise up through the ramparts. There is an old brick-built icehouse, where food and medicines used to be stored. They were kept cold by blocks of ice, which were cut from the moat in the winter and covered with soil and tree branches. There are a number of viewpoints on the ramparts, and also information boards about the history and also the flora and fauna. At the right times of year there are wild flowers; in early spring snowdrops and crocuses are in abundance. Even when it is raining, fishermen sit on the opposite bank with oversized umbrellas. It is just a few minutes’ walk along the ramparts to the Lille Gate. 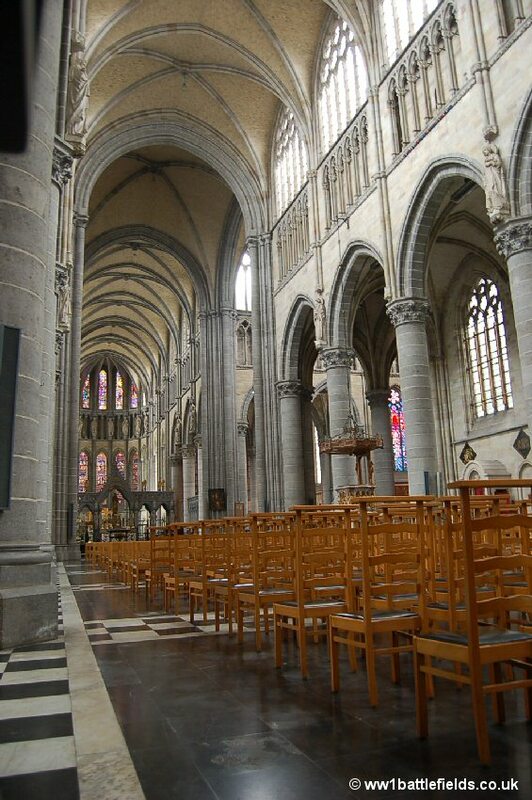 In the centre of Ypres, in the Market Square, is the Cloth Hall. This was almost completely destroyed during the First World War, and it’s hard to believe that it is less than 100 years old. The Cloth Hall houses the In Flanders Field museum, which is a good place to visit to gain some background on the battles around Ypres, although my own preference is for some of the smaller museums such as those at Hooge and at Zonnebeke. 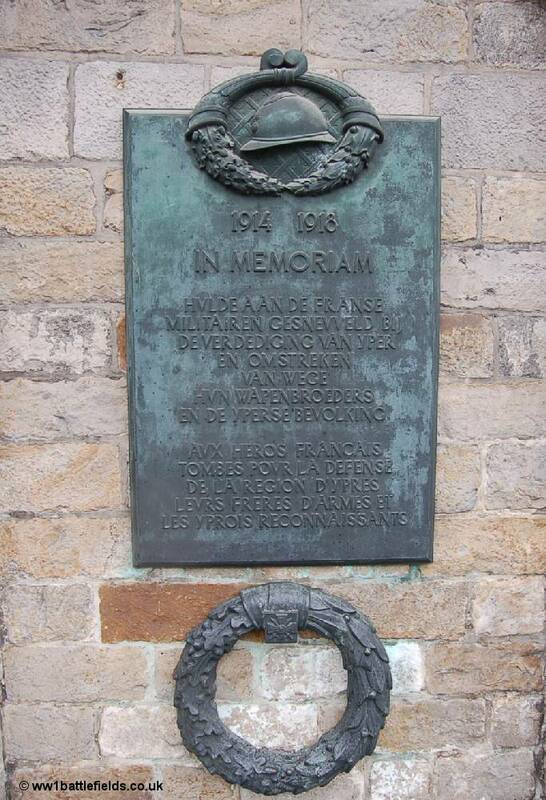 The website for the In Flanders Field museum gives opening times, prices and other information.On the wall of the Cloth Hall are two plaques, one commemorating the French soldiers who died in defence of Ypres and the surrounding area, and the second to Polish soldiers who liberated Ypres in the Second World War. Around the Market Square (or Grote Markt) are many restaurants, shops and bars, and more information on the city and staying here can be found on the Staying in Ypres page. 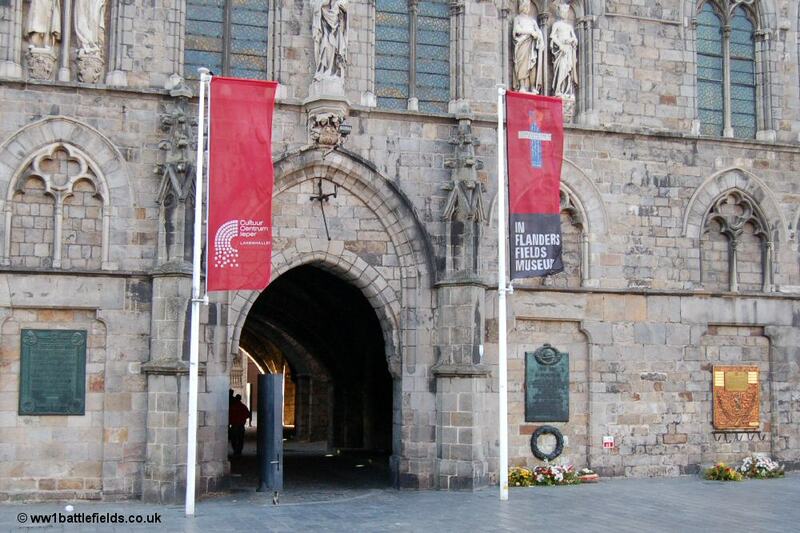 Just around the corner from the Cloth Hall is a Belgian memorial to those who fell in both World Wars. 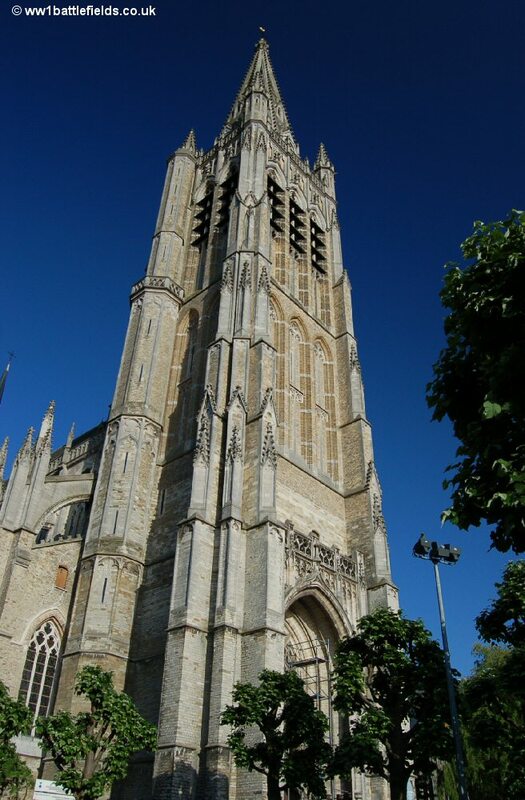 One of the most interesting sites in Ypres is the British church, St. Georges Memorial Church, which has so much of interest that it is covered on a separate dedicated page. Not far from the Cloth Hall is the Cathedral of St Martin and St. Nicholas, which again was rebuilt after the war, and it is very hard to believe, when looking at this magnificent structure today, that it is only around 80 years old. 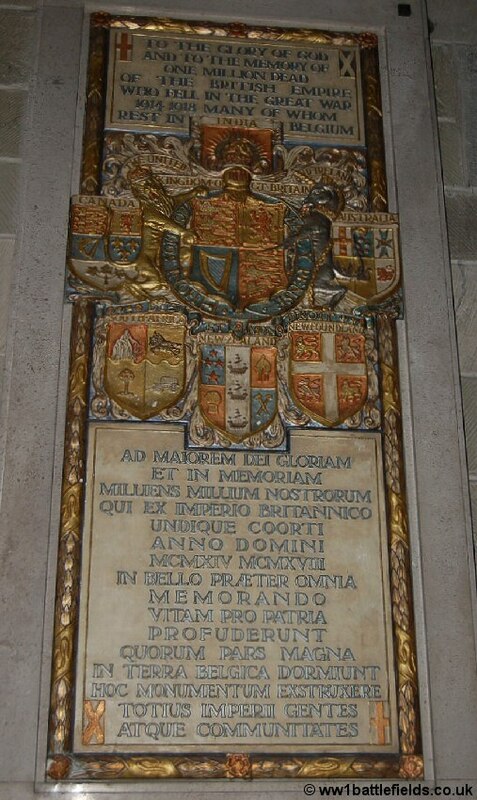 A plaque inside commemorates ‘One Million Dead’ of the British Empire: one of several similar plaques that were placed inside a number of cathedrals in Belgium and France after the War. There is also a plaque in memory of the French soldiers who fought and died. Outside and round the side of the cathedral stands a memorial to the Munsters. 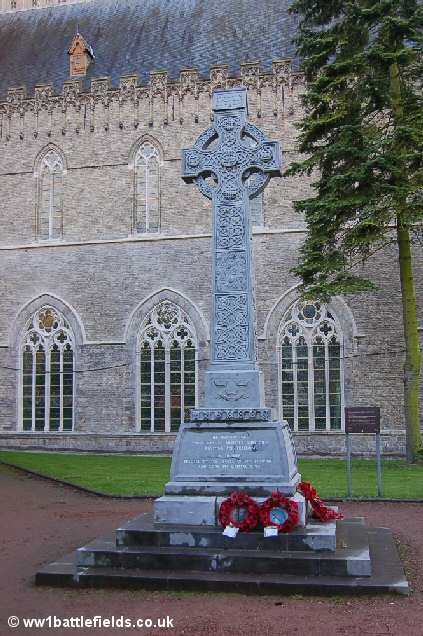 The memorial is in the form of a Celtic Cross, with the three crowns emblem (which from a distance appears to resemble a smiling face), and the inscription at the base reads ‘In memory of those men of Munster who died fighting for freedom. A tribute erected by the people of the Province and Cork its capital city’. An old postcard I have shows the memorial with the cathedral still in ruins behind it; the view today is seen underneath. The Lille Gate leads out of Ypres to the south, and from the top of the Gate you can look towards Messines and the higher ground. A dangerous crossroads known to the soldiers as Shrapnel Corner was located to the south of here. The Lille Gate itself is an impressive structure, which just about survived the war (see images below). Just beyond the Lille Gate is Ramparts Cemetery. Inside the Lille Gate itself signs to several Cemeteries can be seen. These show IWGC, rather than CWGC, and as the name was changed from “Imperial” to “Commonwealth War Graves Commission” in March 1960, the signs must have been at least 45 years old. At some point in about 2005/2006 however, they were removed, and seem now to have been replaced with replicas. The originals were showing their age, whilst the signs that can be seen today are in very much better condition (see photos below).